Originally built by Potter Palmer as a wedding gift for his bride Bertha Honore, Palmer House®, A Hilton Hotel has been a landmark of love from the start. From the lavish ballrooms to the inspired catering to the discerning decor, no other wedding venue boasts such a legacy of romance. 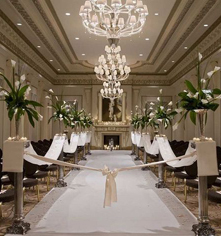 Ideally located in downtown Chicago, the Palmer House has hosted over 9,000 weddings, with each bride choosing the Palmer House as her something borrowed. The experienced wedding team at the Palmer House creates matrimonial experiences that engage, delight, and—above all—reflect the distinctive style and personality of each couple. With a full range of Chicago wedding venue options, a dedicated catering professional, a specially-designed wedding package, and inspired event catering, the Palmer House has everything a bride can dream of. Changing Rooms - Two complimentary changing rooms for the bridal attendants. Seating - Generously sized round tables that seat 10, unless otherwise noted. Linens - A choice of satin lamour floor length table linens. If desired, alternative linens are available at an additional charge. Details - Framed table numbers in gold or silver, personalized menu cards at each place setting, and more. Lightscaping and Sound Design - From the majesty of the State Room to the grandeur of the Empire Room, no detail is overlooked. For that reason, all of our ballrooms are outfitted with state-of-the-art sound and lighting systems, which allows for dramatic lightscaping and exceptional sound design. Available equipment includes microphones and spotlights, which require a sound engineer and/or spotlight operator. Upright pianos and baby grand pianos are also available. Hospitality Suites - Palmer House®, A Hilton Hotel offers its guests a selection of 10 luxurious Hospitality Suites ideal for the business traveler or private event. Each well appointed suite highlights privacy, contemporary style, and technological enhancements creating a corporate or social environment that is intimate and functional. The wedding team can also help with all other aspects of the wedding. That includes the planning of the wedding cake, which will be prepared by the kitchen—voted “Hottest Pastry Kitchen” by Hotel F&B Magazine. 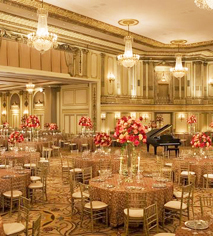 To start planning an unforgettable wedding at Palmer House®, A Hilton Hotel, submit an RFP.